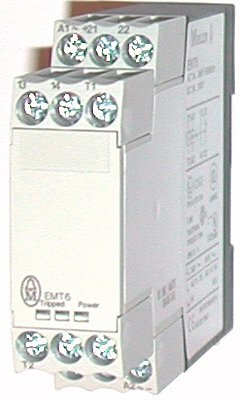 EMT6 Klockner Moeller thermistor-controlled overload relays. Suitable for motors with Positive Temperature Coefficent (PTC) Thermistors embedded in their windings. Series EMT6 replaces previous EMT5 units. Units trip when thermistors exceed 3600 ohms and recover under 1600 ohms.